Turgeon Engineering, Inc. has over 60 years of experience in analog design, testing and simulation. Our proven methodologies save you time and money while increasing your ability to meet your customer's requirements. Turgeon engineers are professional, experienced and versatile. We can work as part of your design team or in a complete design to fabrication outsourcing mode. Our designs work for you. Turgeon engineers have over 50 product successes in industries such as: Defense, Automotive, Communications, Aerospace, Computing and Storage. Click on a service below to see how Turgeon Engineering can fulfill your IC needs. Turgeon Engineering can handle every detail of integrated circuit design, from defining specifications to final analysis and error-checking. We specialize in reliability, using time-tested fundamentals to guarantee the performance that our customers expect. Turgeon Engineering uses a custom version of Berkeley SPICE3 to ensure that simulated data matches the performance of the final product. It is also capable of handling extremely complicated designs in a timely manner. Our versatility allows us to integrate our customer's tools, allowing us to properly simulate any netlist. Turgeon Engineering can create an electrical model for almost any component available in SPICE simulations. Our models account for both electrical and physical device characteristics and we create corner models to maximize efficiency and reliability. Turgeon Engineering's thermal analysis guarantees accurate performance over temperature variations. We can detect the thermal sensitivities of an IC, allowing temperature conditions to be accounted for prior to manufacturing. 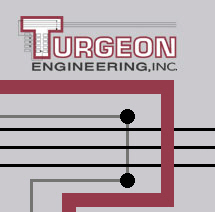 Turgeon Engineering has extensive experience with IC layout. We can provide the tools and experience to ensure that your schematic is translated accurately and that every specification is covered before production. Turgeon Engineering has developed a versatile test system, capable of measuring every device specification. We provide an accurate circuit environment and ensure that faulty parts are discovered before being put to use. Full automation and computer-controlled testing allows maximum throughput and repeatability. Turgeon Engineering's test system employs active laser trimming, ensuring that each device is optimized for maximum performance. Optical recognition software identifies targets so they can be cut with pinpoint accuracy. Turgeon Engineering has worked with numerous vendors that specialize in dicing and packaging ICs. Our experience can help you find the right packaging house so that your IC fits your system. Turgeon Engineering has assisted in the fabrication of dozens of parts. We can help you find a foundry that will meet your needs in process, time and cost. Copyright 2002-2013 Turgeon Engineering, Inc.